Large Hydrangeas have an almost cloud-like softness to them - you could almost imagine laying down in a bed of them and drifting off to dream world. And we've perfectly captured that feeling in this amazing reproduction. 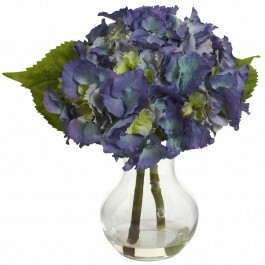 Gorgeous Hydrangeas stems, leaves, and a burst of softness that only the Hydrangea can offer. Comes complete with a glass vase and faux water. H: 7 In. W: 4.5 In. D: 4.5 In.